Diplodocus dinosaur, illustration. Diplodocus, discovered in 1877, is one of the longest known dinosaurs, reaching a length of 35 metres. 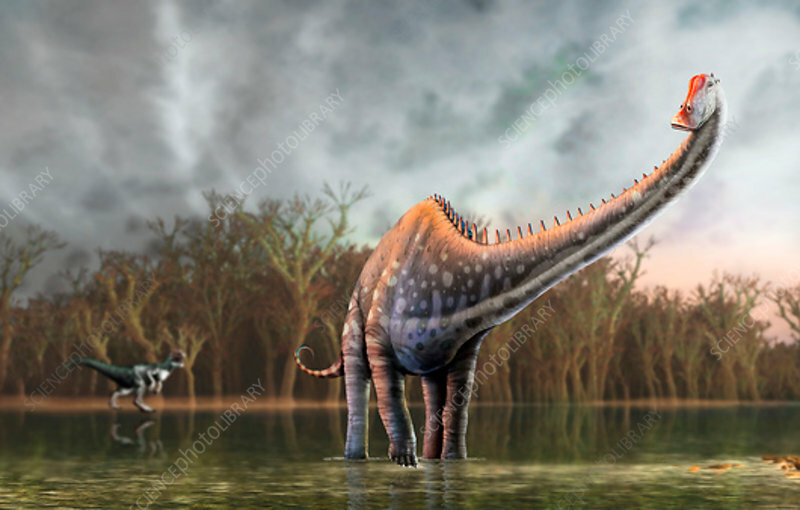 Most of that, however, was tail and neck, meaning that the animal only weighed 10 to 15 tonnes, much less than the bulkier sauropods of similar length, such as brachiosaurus. Diplodocus lived in the Jurassic period, around 155 to 148 million years ago, in what is now North America. A predatory dinosaur, allosaurus, is seen in the background.